My favorite greens don’t get enough love. 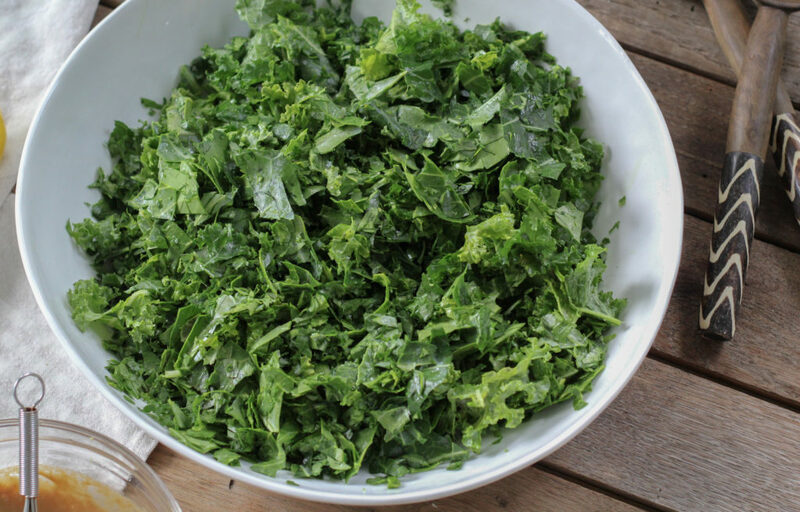 We only hear about collards for New Year’s, and then the rest of the year, it’s kale, kale, kale. Don’t get me wrong, I like kale. But my collards triple them in size, and I want to use them in all the same ways. The flavor is so similar. I think the reason collards always play second fiddle to kale is their lack of fancy ruffles. 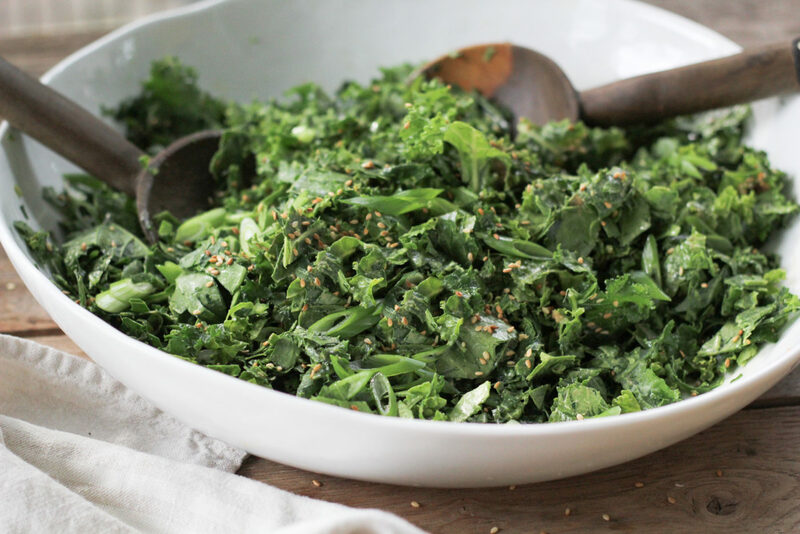 Even though kale can be just as dense as collards when the leaves get big, the ruffles make kale seem lighter, fluffier, and more palatable in raw salads. So here’s my work-around: chop ’em up and mix ’em together. This way they’re more forkable, as Toby says. It’s a big pile of hearty greens, but as long as there’s a good dressing, I can get down with that. It is January after all, and time to hit the reset button and be healthy (at least until Gasparilla). 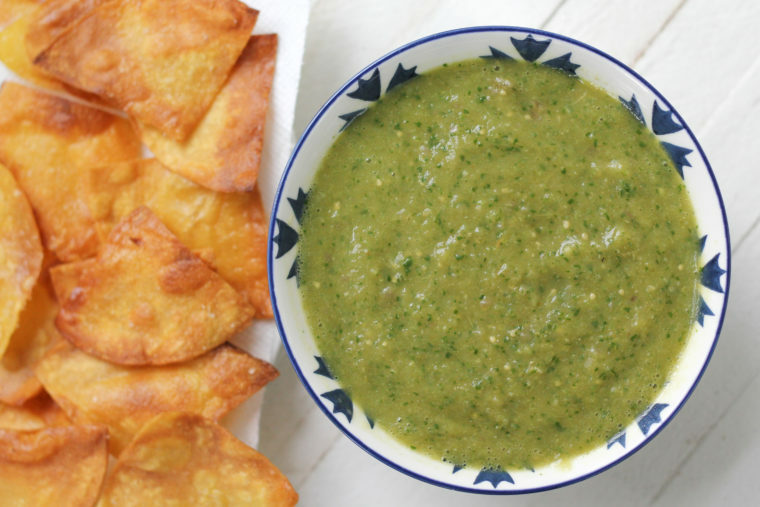 And about that dressing…. One thing I’ve learned after making a ton of these salads: light, wimpy dressings are no match for a giant pile of raw greens. You need enough oil to coat and tenderize these leaves, almost marinating them. 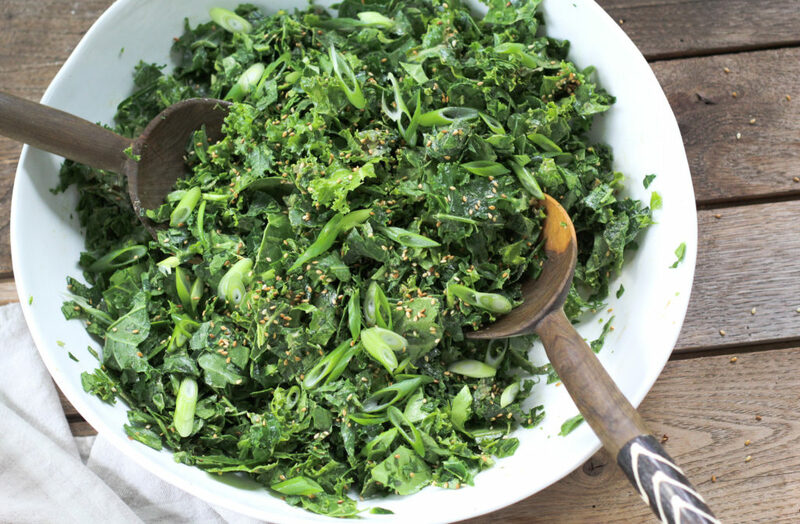 And with the bold green flavor of kale and collards, you need a dressing with enough punch to stand up to them. 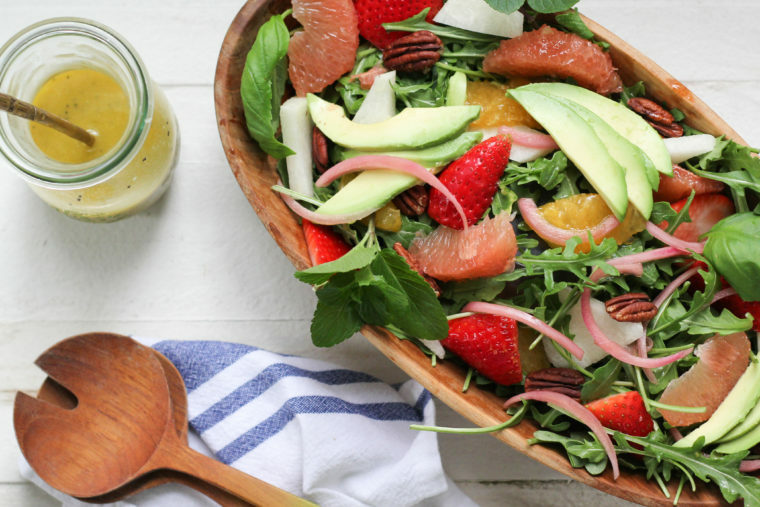 This lemon tahini dressing does the trick. It’s got ginger and garlic, plenty of bright lemon and a bit of honey to sweeten the deal. Toss it together and watch all those leaves turn emerald green, my favorite color. 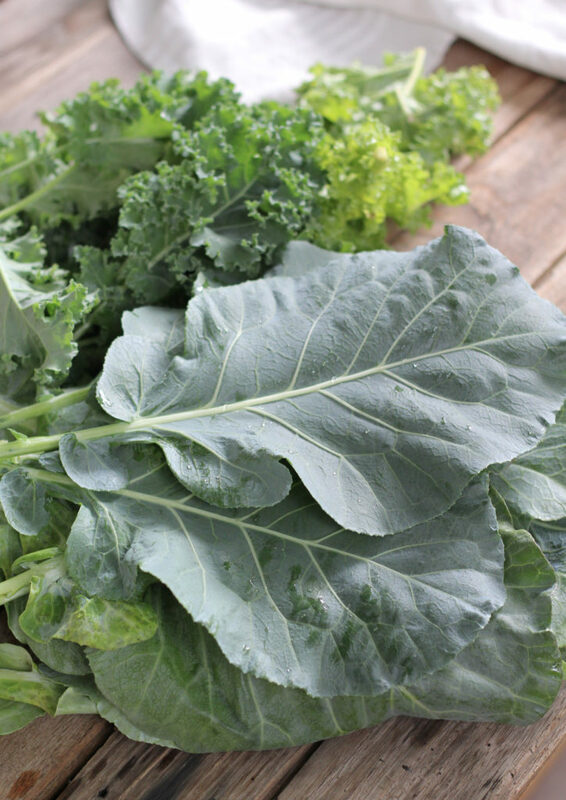 Wash and dry the collards and kale. Remove the tough center stems. Chop the leaves into 2-inch pieces and place in a salad bowl. 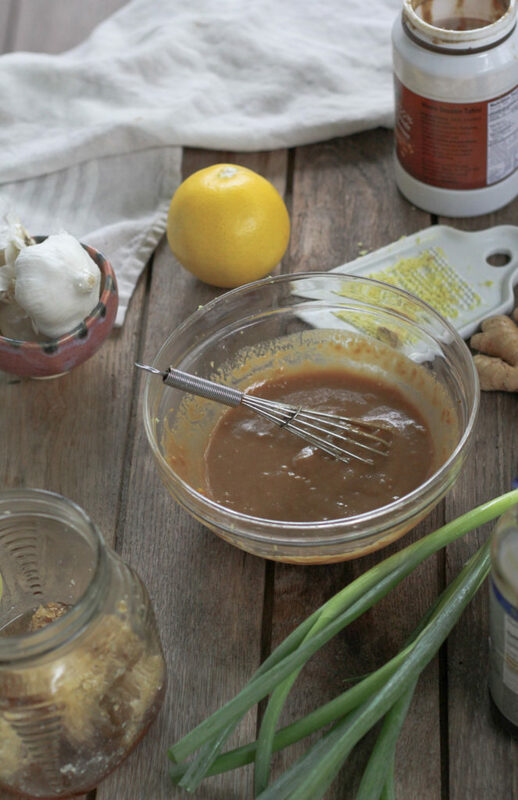 Whisk together all the dressing ingredients in a small bowl. Taste and adjust the flavor (a little more tamari if you think it needs more salt, a little more honey if you like it sweeter, etc.) Drizzle about half the dressing over the salad and toss. Add a little more, or whatever it takes to make sure all the leaves are plenty dressed. Allow it to marinate for at least 15 minutes. Add your desired toppings just before serving, along with the rest of the dressing on the side. Definitely going to try this. 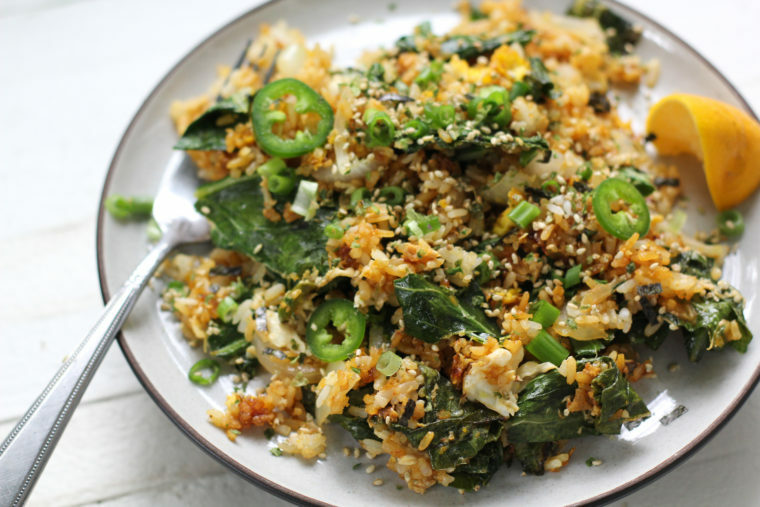 I’m always looking for ways to use collards and kale. Our late started vegetable garden is still not producing, but thankfully, we can buy from a local organic gardener at our Farmer’s Market. I wish I had a farmer’s market as good as the one in Ft. Pierce. Our old friends, the Rices, sell amazing homemade salsa there. It’s supposed to be their twin sons’ business, but it’s usually the parents selling it while the boys are surfing. 🙂 I can’t wait to get more. I’ll have to try that salsa! Is it called Rice’s? Phil is usually our household Farmer’s Market shopper, so I haven’t been in a while. They call it Salsa Fresca, sold in mason jars. Definitely add it to Phil’s list! Thanks Danielle. I can’t wait to have some! Looks wonderful. Definitely going to make it as I know you won’t be able to keep up with eating all your own greens next door. I did make a Pureed Vegetable Soup with Collards last week with your greens that was very tasty and well appreciated by my friend with the flu with whom I shared. 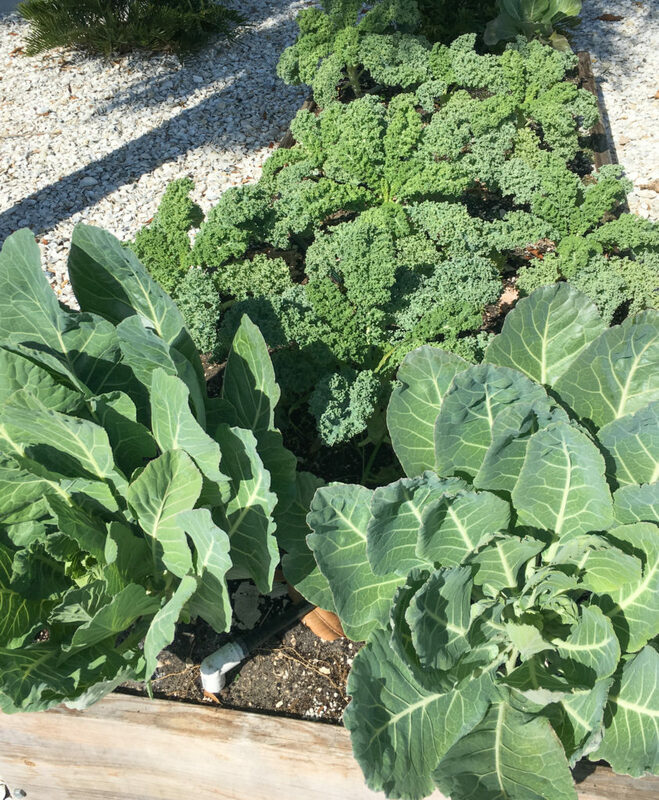 Your Pine Island garden collard leaves are PERFECT. We are grateful and fortunate to be your neighbors!